?????? ?2 © 1990 Namco, Limited. Wagan Land 2 was released on December 14, 1990 in Japan. The story takes place several years after the other Wagan Land games (but before Wagan Paradise), in which the player takes control of Wagan II, the son of the original Wagan. The final battle theme in this game would later be used as the final battle theme in Super Wagan Land. The boss introduction theme would be used in Super Wagan Land as well. 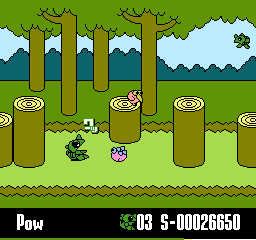 The boss battle theme was used in Super Wagan Land, as well as in the later DS sequel.